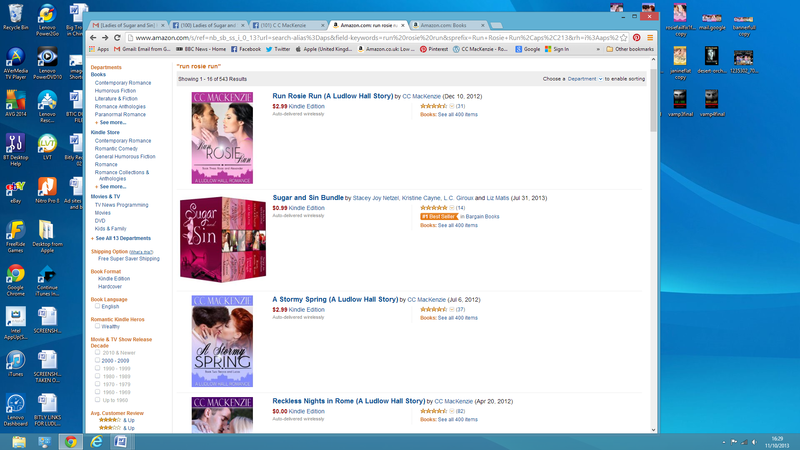 A couple of months ago you might remember I mentioned that the lovely romance author, Nana Malone reached out to me, Stacey Joy Netzel, L.C Giroux, Liz Matis, and Kristine Cayne and asked us if we’d consider being part of a romance boxed set. And we jumped at the chance! We titled the boxed set, Sugar and Sin. Working with the girls has been one of the best author experiences of my life. We bring many strengths to the party. During our on-line meetings we have plenty of laughs while we power through the decision-making and get things done. And today we are officially Amazon best sellers by hitting number one in Kindle Deals. I never thought I’d ever see this day so I’ve taken a screen shot. We’re about (fingers crossed) to hit the overall Amazon top 100 best-selling books and if that happens the champagne will be opened in this house. There are almost 3,000,000 million books published on Amazon and to say competition is fierce is something of an understatement. By participating in the boxed set it has brought visibility to the rest of our books. It’s an amazing feeling to reach and hear from new readers. Every message saying a reader has enjoyed the stories makes our day. So, we’re about to embark on another endeavour. This time there will be seven of us because we’ve been joined by the awesome author/editor Dana Delamar and will be The Magnificent Seven when we publish our next Sugar and Sin boxed set. And I have news of a thrilling and chilling paranormal romance boxed set too, so watch this space. The fabulous thing about being independent authors is the way we can be nimble-footed in a rapidly changing business environment to give readers what they want more of and I’m thrilled to be a small part of a great team. I want to take this opportunity to thank DeeDee Scott who began the blog WG2E, which has now finished, and Alicia Street who began the WG2E facebook Street Team, Rhonda Hopkins and Tamara Ward. It was through the street team that I’ve met fellow authors whose support and encouragement and sheer positivity has humbled me. They have truly caught me when I’ve fallen. And the stupendous WANA group (We Are Not Alone) who are always there to share laughs and information, their names are too numerous to mention but they know who they are! I love you guys so much. I hate blowing my own trumpet but can you tell I am utterly thrilled? This entry was posted in e-publishing, SUGAR AND SIN BOXED SET and tagged BEST SELLER, BEST SELLING AUTHOR, C C MacKenzie, contemporary romance, Dana Delamar, kINDLE DEAL, Kristine Cayne, L.C Giroux, Liz Matis, Nana Malone, Run Rosie Run, Stacey Joy Netzel, Sugar and Sin boxed set, Tamara Ward by CC MacKenzie. Bookmark the permalink. Not sure how I missed this because I have all of your books, but I just zipped over and purchased the set, just doing my part for your champagne party! Good Luck! Thank you so much for your support and I hope you enjoy finding new authors! Thank you! Can you believe it’s two years since WANA? We blooming well do work hard! Those top four entries look mighty familiar. Way to go, Christine! I’m so happy for you. It’s been a joy, Pat. And I never thought I’d say that about publishing!!! Hi August, it’s been a ride! I love your Sugar & Sin collection, Christine. It’s beautifully packaged and the authors and their books are all awesome. Congratulations on your success! Thank you. And I look forward to working with you very soon! Hi Karen, thank you for the continued support. This year has not been easy, so this is a nice surprise. This is fabulous, CC! Woo Hoo!!! Sending cyber high-fives your way!! Thank you, Diane! Just following in your footsteps, missus! Just purchased and Congrats to you and all the other authors! Will anticipate the next one!! Thank you, Cindy! We appreciate the support! And I’ll keep you posted on what’s coming next. It’s been a year since Thor appeared on the blog. What’s he up to?